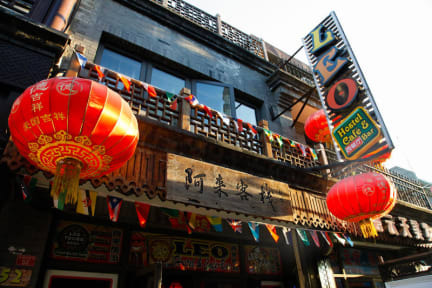 Leo Hostel i Beijing, Kina : Boka nu! Best staff ever, I had problem with my visa and didn't know what to do n they help me. Really helpful. If you look for meet new ppl this is the place. Close to The Forbidden City, n all lot of food places on the street. The food om the hostel is good as well. Check the weather, came on the winter n didn't packd for -4 °. Only down side is the cold rumes in the winter. Such a nice hostel and atmosphere. Towel rent was 10 yuan though.... But the staff were really really nice. Great common area. The showed good films and played great music. Great breakfast street food right outside and close to the metro. And mc Donald's. Fräscht, trevlig personal, bra läge, mycket ungdomar. Breda sängar (även våningssängarna). Supernöjd :) enda negativa är att det är ganska lyhört och lite fuktigt i rummet. Annars har jag inget att klaga på! A great hostel! The location is really great and there are a ton of nice, cheap restaurants nearby. The staff are very helpful and the common area is nice. You can’t have your own food in the common area but is allowed to stay there without buying anything. One really annoying thing though is that there were no toilets on the second floor were we stayed which meant that we had to go downstairs, through the common area, every time we needed to go to the toilet.. But it was a great hostel anyways! Nice hostel, great location. Also they offer a really good great wall tour, with no tourists at that spot they go to. Väldigt prisvärt hostel som ligger riktigt bra! Helt ok hostel, väldigt bra läge. Sov gott trots att det var extremt kallt i rummet. Duschar och toaletter ok.